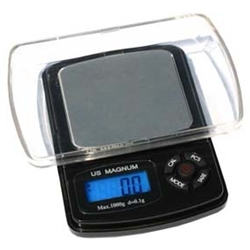 This BRAND NEW "Magnum 1000XR" digital pocket scale manufactured by US Balance features a bright blue backlight and convenient 5 button controls. The parts counting function (PCS) makes it possible to count large quantities of parts of the same weight. Capable of weighing a mass up to 1 kilogram the Magnum 1000XR gives you high precision for an affordable price, not bad for a weight instrument that fits in your shirt pocket! This sturdy and versatile unit is perfect for any home weighing use.